In researching these “contradictions in the Bible” it has become plain to me that those who are contending there are contradictions fall into two categories: those who don’t believe the Bible is the ‘inspired’, trustworthy and accurate Word of God and those who don’t believe in God. These are the same kind of people who heard Jesus’ words, saw His miracles and said He was getting His power from Satan. I have continued with this series because there are those who are immature in the Word of God and have only the ‘milk of the gospel’ (Isaiah 28:9, 1 Corinthians 3:2, Hebrews 5:12-13, 1 Peter 2:2) and need to mature into the ‘meat’ of the gospel. Was Jesus' first sermon plain or mount? This is another instance of either a misunderstanding of scripture or ignorance induced arrogance. His first sermon was in the wilderness, where He preached to Satan about not twisting the Word of God. If this question is about the Sermon on the Beatitudes, they (yes, I said they) were given in two locations. On the MOUNT Jesus gave eight blessings and in the sermon on the PLAIN, He gave four blessings and four woes. As far as His first preaching, Matthew 4:17 says: “From that time Jesus began to preach, and to say, Repent: for the kingdom of heaven is at hand”. He was by the Sea of Galilee at that time. How many angels were at the tomb? Matthew 28:2-6 says: “And, behold, there was a great earthquake: for the angel of the Lord descended from heaven, and came and rolled back the stone from the door, and sat upon it. His countenance was like lightning, and his raiment white as snow: And for fear of him the keepers did shake, and became as dead men. And the angel answered and said unto the women, Fear not ye: for I know that ye seek Jesus, which was crucified. He is not here: for he is risen, as he said. Come; see the place where the Lord lay.” John 20:10-12 says: “Then the disciples went away again unto their own home. But Mary stood without at the sepulcher weeping: and as she wept, she stooped down, and looked into the sepulcher, and seeing two angels in white sitting, the one at the head, and the other at the feet, where the body of Jesus had lain.” Apparently there was one angel out side and two inside the tomb. If these two quotes were written consecutively there would be no doubt that they were two different periods of time. We also can see that the countenance of the angel was so great that the guards fainted. These were the same guards that took bribes to say the disciples stole the body. The punishment for dereliction of duty while on guard duty was death. The other part of the bribes was that the Pharacies would see that they would not be punished. Luke 23:23 says: “And when they found not his body, they came, saying, that they had also seen a vision of angels, which said that he was alive”. The women had gone back to the house and reported seeing angels (plural). Human vs. ghostly impregnation? Acts 2:29-30 says: “Men and brethren, let me freely speak unto you of the patriarch David, that he is both dead and buried, and his sepulcher is with us unto this day. Therefore being a prophet, and knowing that God had sworn with an oath to him, that of the fruit of his loins, according to the flesh, he would raise up Christ to sit on his throne.” Matthew 1:18 says: “Now the birth of Jesus Christ was on this wise: When as his mother Mary was espoused to Joseph, before they came together, she was found with child of the Holy Ghost”. The infidels.org web site gave Acts 2:30 and Matt.1:18 to demonstrate a contradiction. Taking Acts 2:30 without the context of verse 29 is at the least dishonest. Mary’s family line was from the loins of David, therefore Mary was the fruit of David’s loins that was spoken of. Mary’s lineage made Jesus ‘man’, while the Holy Ghost made Him God. Cover head to pray or not? In the Old Testament, people were supposed to pray with their heads covered. Men would wear a head covering of some kind and a woman’s hair (probably because her hair was her glory, 1 Corinthians 11:15) qualified as her covering. In the time when Jesus was here in human form, Jewish men just as today had prayer shawls. It is my opinion that the shawl qualifies as being in your closet to pray. Men would pull the shawl up over their head to pray because a man was not supposed to pray uncovered. We no longer need the head covering to pray as Jesus is the covering for Born Again Christians. Nothing needs to cover us when we pray: a yamaka, a shawl, a priest or anything else. If we pray with a hat, shawl or something else on our head, it does not interfere with our prayers because the Holy Spirit indwells us and we pray from the heart. Did anyone beside Paul hear the voice? In Acts 9:7, it says the men who journeyed with Saul stood speechless, hearing a voice, but seeing no man. There is precedent for this; where some see and hear, while others don’t. Daniel 10:5-7 says: “Then I lifted up mine eyes, and looked, and behold a certain man clothed in linen, whose loins were girded with fine gold of Uphaz: His body also was like the beryl, and his face as the appearance of lightning, and his eyes as lamps of fire, and his arms and his feet like in colour to polished brass, and the voice of his words like the voice of a multitude. And I Daniel alone saw the vision: for the men that were with me saw not the vision; but a great quaking fell upon them, so that they fled to hide themselves”. 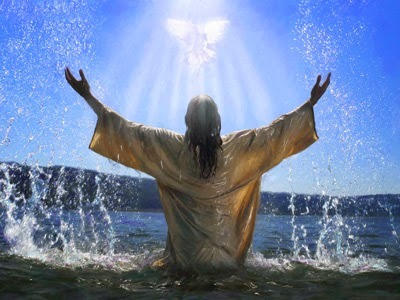 Matthew 3:16-17 says: “and Jesus, when he was baptized, went up straightway out of the water: and, lo, the heavens were opened unto him, and he saw the Spirit of God descending like a dove, and lighting upon him: and lo a voice from heaven, saying, this is my beloved Son, in whom I am well pleased”. Matthew 17:5 says: “While he yet spake, behold, a bright cloud overshadowed them: and behold a voice out of the cloud, which said, this is my beloved Son, in whom I am well pleased; hear ye him”. Mark 9:7 says: “and there was a cloud that overshadowed them: and a voice came out of the cloud, saying, this is my beloved Son: hear him. Luke 9:35 says: And there was a cloud that overshadowed them: and a voice came out of the cloud, saying, this is my beloved Son: hear him”. 2 Peter 1:17-18 says: “For he (Jesus) received from God the Father honor and glory, when there came such a voice to him from the excellent glory, this is my beloved Son, in whom I am well pleased. And this voice which came from heaven we heard, when we were with him in the holy mount”. As we can see, God is selective as to whom he allows to hear His voice. As with all of my writings, everything must be compared to the Bible, for verification. Unless otherwise noted, all Bible quotations are from the King James Version.